Fiji's military chief Cmdr Frank Bainimarama has warned he will overthrow the government on Friday, unless his demands are met. Cmdr Bainimarama accused Prime Minister Laisenia Qarase of stalling on a pledge to scrap controversial legislation. Fiji has been tense for weeks amid a stand-off between the two men. "I think it's about time we end this impasse," Cmdr Bainimarama told a press conference, adding that it would be a "peaceful transition". Prime Minister Qarase had earlier appeared to back down by agreeing to suspend work on the laws, one of which would grant amnesties to those involved in a 2000 coup. He also hinted that possible sedition charges against Cmdr Bainimarama could be dropped, and Fiji's police chief's work contract might not be renewed when it expired. But Cmdr Bainimarama - who wants the police chief removed immediately - appeared to reject the concessions at a press conference. Cmdr Bainimarama reiterated his ultimatum and said that unless the government met all of the army's demands fully, all cabinet ministers and advisers should resign. "I give him until tomorrow afternoon to comply with our demands or I will start the clean-up campaign," he was quoted as saying. Cmdr Bainimarama said the government had until 1200 on Friday (0000GMT) to act. Australia warned that a coup could be seriously damaging for Fiji. "Fiji risks international isolation if the military proceeds down this dangerous path," Foreign Minister Alexander Downer said. Australia is to host a meeting of Pacific Islands Forum foreign ministers on Friday, called at the request of Mr Qarase, where they are expected to discuss tensions in Fiji. Under the so-called Biketawa Declaration, members of the Forum can come to another state's aid in times of unrest - if a government requests it. The military has warned foreign countries against intervening in Fiji. Cmdr Bainimarama met Prime Minister Qarase for talks in New Zealand on Wednesday but the two men appear divided over the outcome of the meeting. Mr Qarase said he was prepared to review - and eventually abandon - the laws that have provoked Cmdr Bainimarama. But the military chief dismissed the meeting as a "failure" and questioned Mr Qarase's readiness to act on his pledge. Cmdr Bainimarama objects to legislation put forward by the prime minister that offers a pardon to people involved in the 2000 coup and allocates the ownership of coastal land to ethnic Fijians. 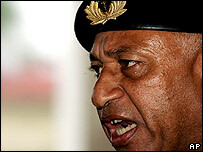 The current military chief was a target of the 2000 coup, a short-lived attempt to install a government of ethnic Fijians. 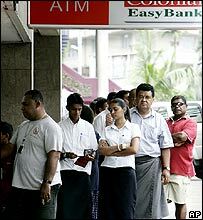 Fijians have been buying emergency supplies of food and withdrawing money from banks, amid fears a military coup could bring chaos and closures. On Wednesday, the military performed overnight exercises in the capital, Suva, stoking speculation that a coup was imminent. Are you in Fiji? What is the atmosphere like? Are you concerned about the possibility of a coup? Send us your comments and experiences.